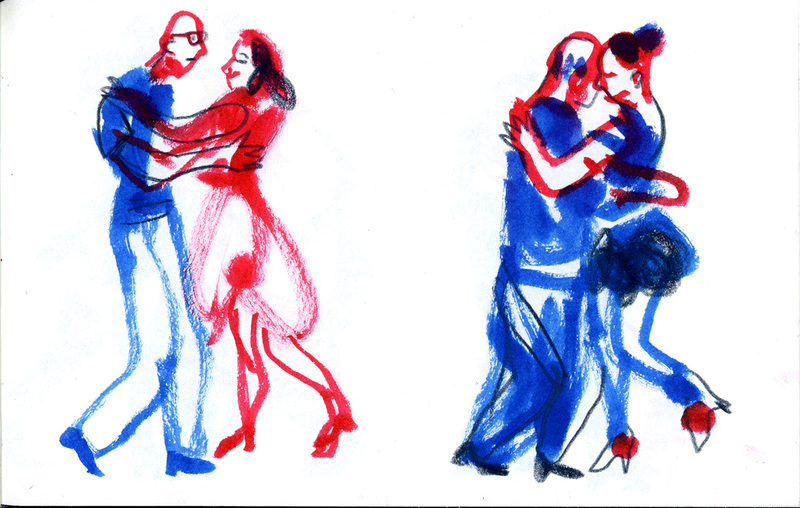 Milonga in Jaffa, in the heart of the old city, between churches, minarets and synagogues, hummus and baklava eaters, fitted somehow perfectly to the colorful atmosphere of this place. 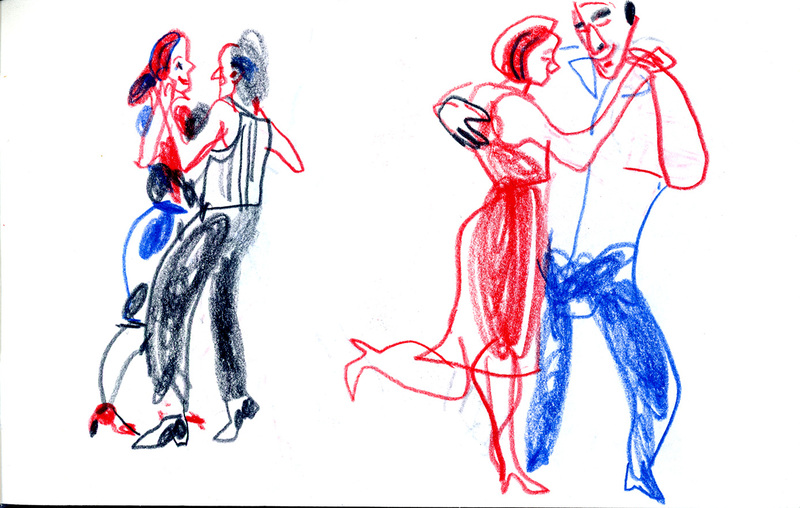 Last year during our trip to South America, I was lucky to sketch milongueros in the place were tango was born - Buenos Aires. I was surprised to discover that our local community looked not less professional! 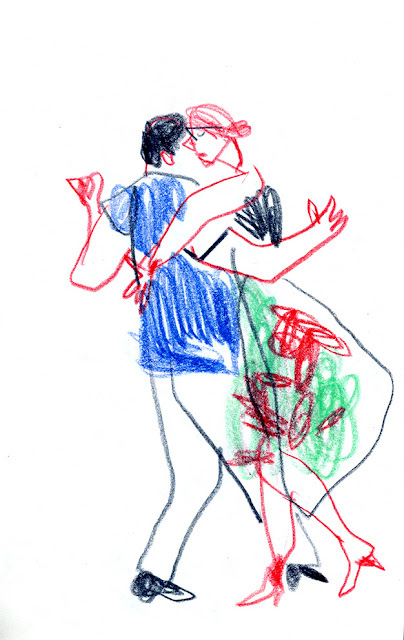 Dancers came equipped with their dancing shoes, dressed as it supposed from tango dancers, in different ages and origins, but all burning from inside with similar passion, they created magic when they moved together with music. It's so inspiring to see a group of people united by common passion. Especially when they so beautiful as tango dancers! 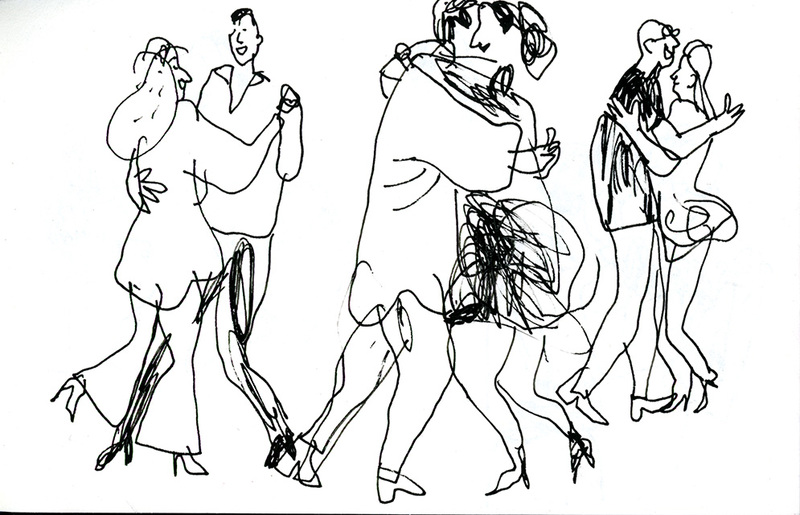 It took to me a while to start to sketching - I was fascinated and felt like sketching with my eyes. But after a few clumsy lines, little by little I entered to the pace... It was real fun! 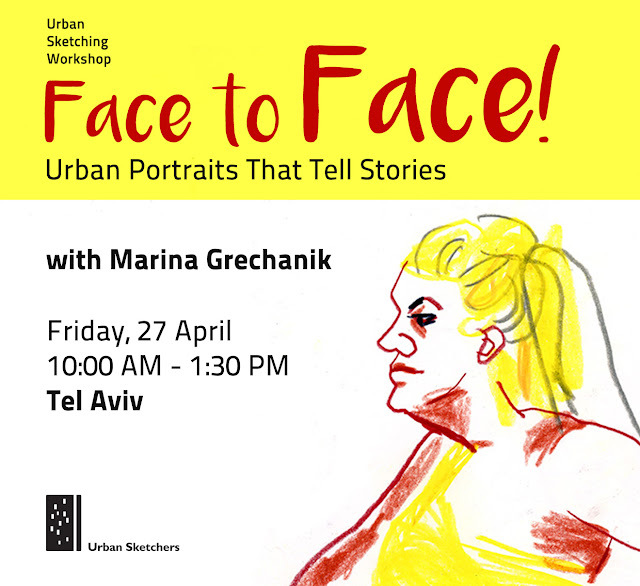 I'm happy and excited to invite you to my workshop, which will focus on what I love the most - sketching people, and particularly - in portraits and how tell the story through a human face. Space is limited: contact ultramarin71[at]gmail.com to make a reservation and arrange payment. Skill level: Suitable for all ability levels. For me there is no more interesting subject than sketching people, and of course the most fascinating part is - their faces. 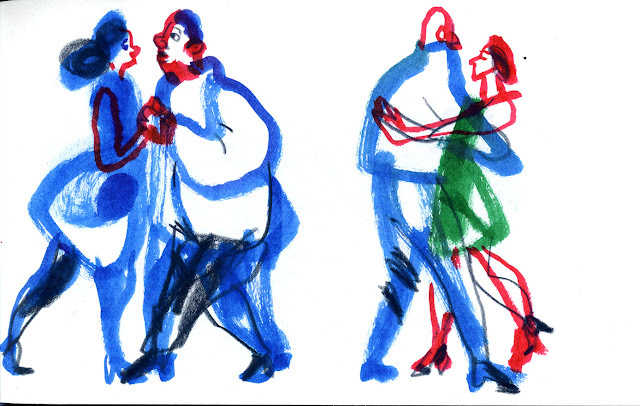 When I can't pull out my sketchbook, I catch myself sketching with my eyes - watching the celebration of the human faces that constant surrounds us - men and women, adults and children, faces in all shapes and colors - talking, laughing, crying, telling us about themselves in all sorts of ways. In this workshop we'll practice drawing portraits, but not in a traditional academic approach. · Blind contour - draw without looking at the paper. 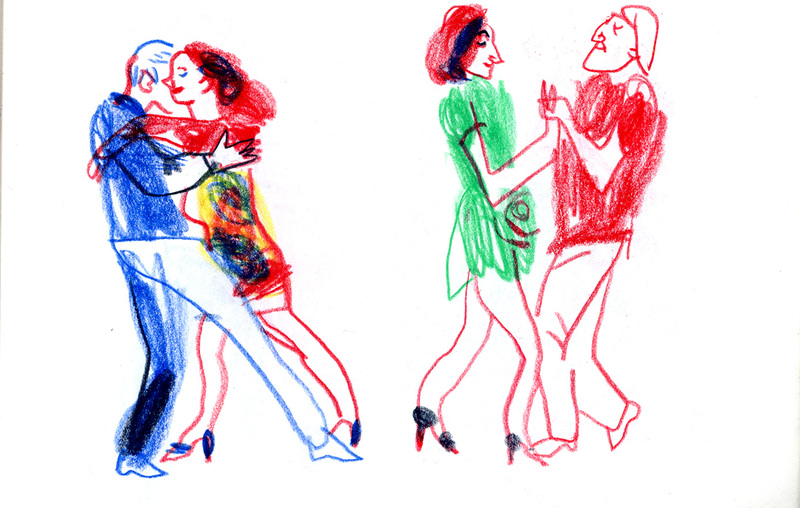 · Simultaneous sketching - look at each other expressing certain emotions. Finally, we will share the portraits and discuss what each exercise contributes. 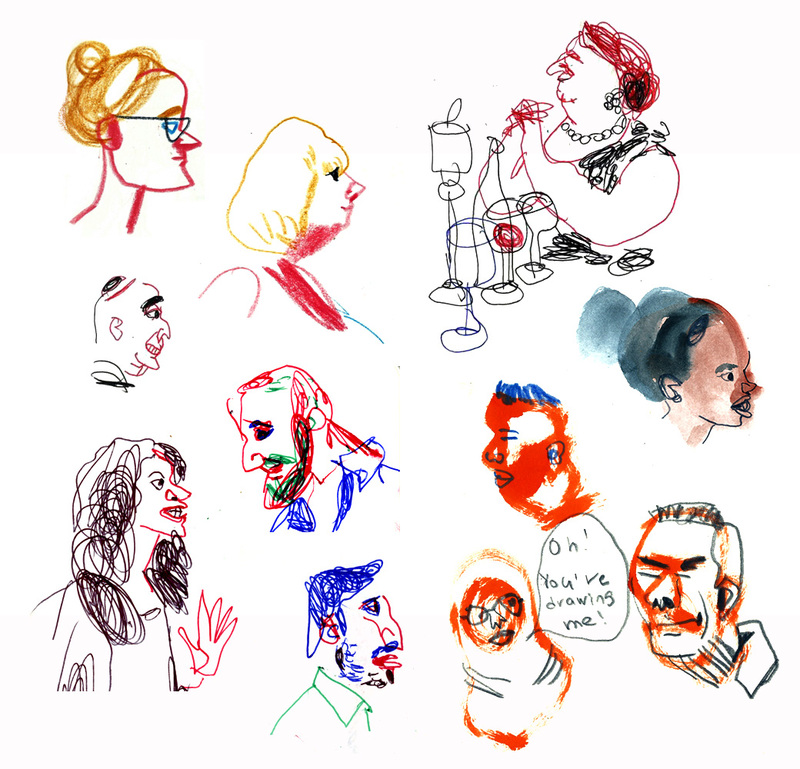 After the warm-up, we will sketch fast portraits of people passing by on location. We'll give a title to each portrait. The title can show what we think about the character or what she/he looks like. 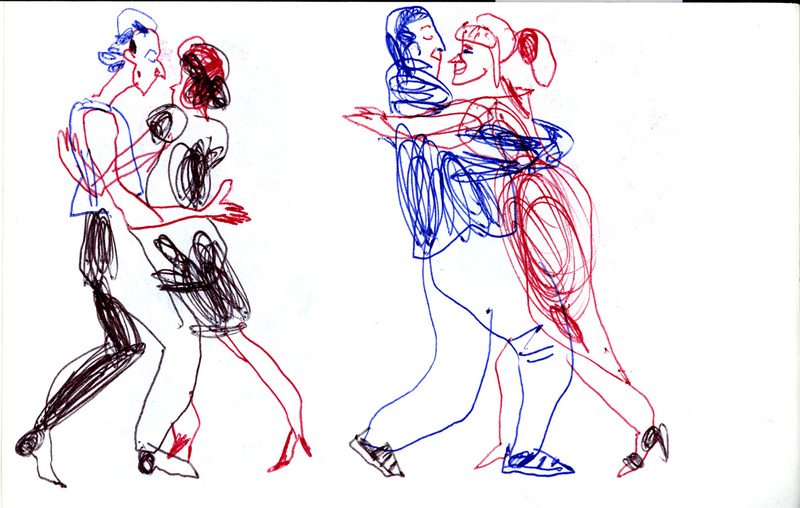 We'll try to apply what we've learned in the previous exercises and pay attention to hand-eye coordination, capture the expressions of emotions and strengthen the essential and what is authentic in each character we sketch. At the end of the section, participants will display as many portraits as they made in various approaches and will share their feelings during exercise. We'll tell visual stories based on a portrait of a stranger from observation. 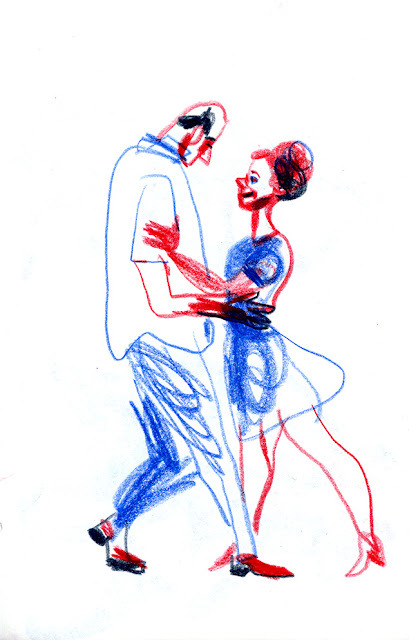 The sketch can include the full figure drawing, but the focus should be on his/her face. Besides creating an external likeness, we will try to transfer the character's personality and our relation to it. We'll build our subjective story. At the end of the session participants will introduce their stories and share experiences. · A package of chip A5 or A4 sheets and a clipboard. · Bigger sketchbook of quality paper for the last exercise. · Your favorite tools for the last exercise. 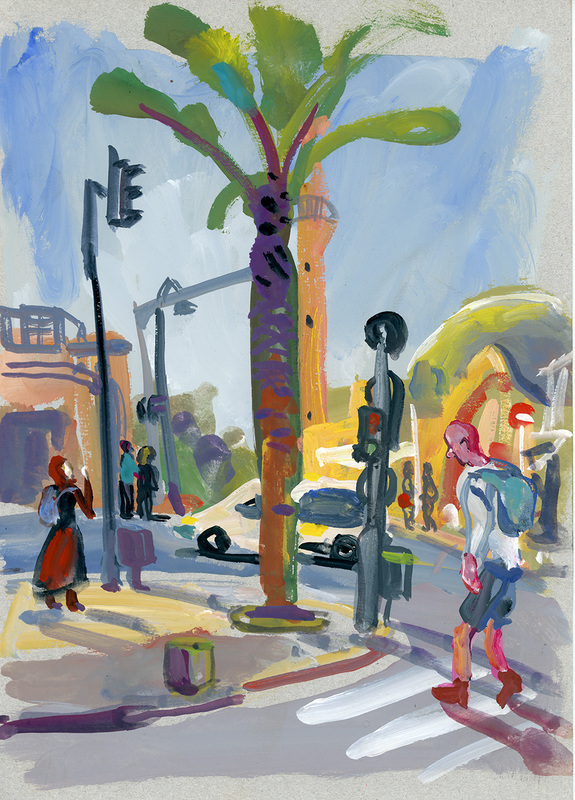 I'm in Jaffa again, having some sketching time with my friend Nathan. 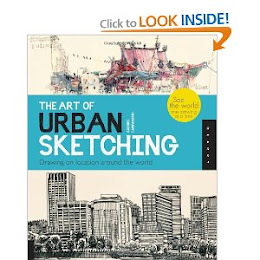 We're looking for the perfect spot, were we can combine drinking coffee and sketching. When we pass near Dr. Narghile shop, the decision comes to us simultaneously. We sat down in front of the shop on the heavy old chairs padded with red and black stripped cloth. 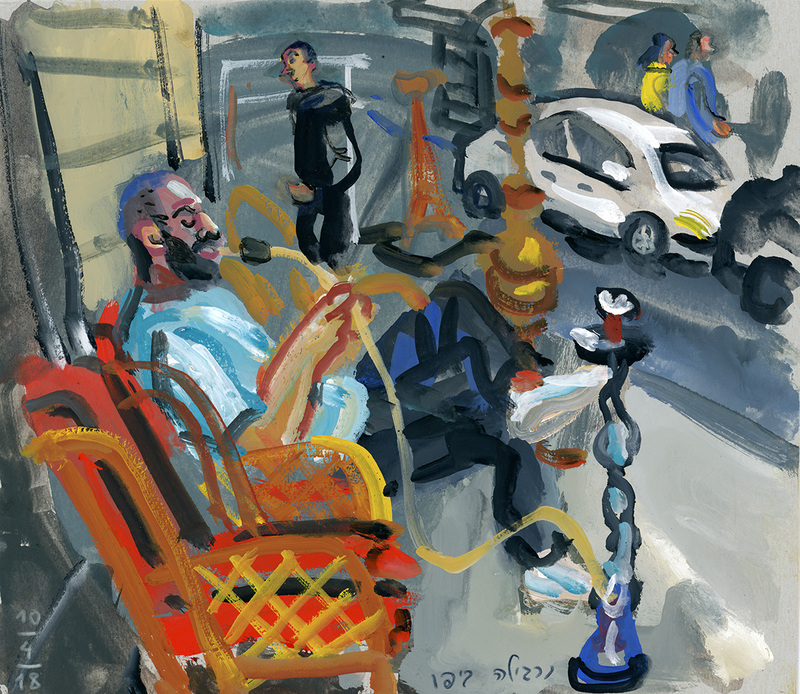 I'm starting to sketch three men smoking narghile near me, but they're taking out their wallets and paying - what a pity! I need to wait for a new victim. It comes immediately - young bearded guy, looking for some calm moments and the last rays of the spring sun. My second sketch - glance to the opposite side, to the busy junction with Jeffet street. 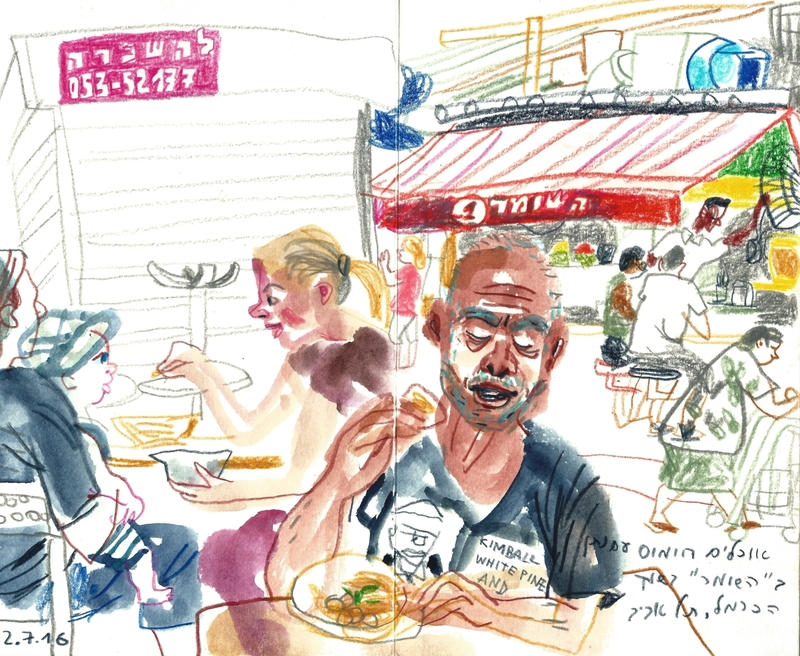 There is so much going on all the time - tourists, locals, Arabs, Jews... looks like everybody have enough place and understand each other in different languages. I'm looking for the spot for the another sketch, decide to sketch the view just opposite me. 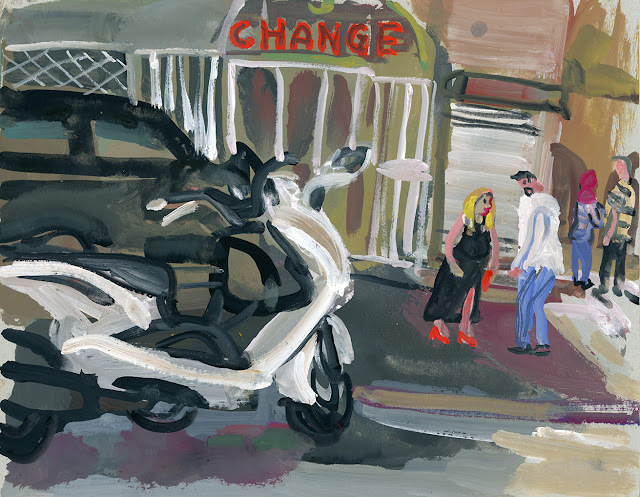 It looks boring, big motorcycle is blocking my view, but I want to find a story in what I see. Suddenly interesting couple entering to my frame. Big blond woman wearing long black dress with a big split and red high heel shoes and red bag which complete the look. "Please, stay here for a while!" - I'm whispering. And what a gift - looks like the woman asking her man to take a photo of her, they are staying there for a few minuets, talking one to another and looking for a nice spot, finally leaving the place without taking a picture. But I got my few minuets to add them to my sketch and have the story I looked for!